You can make your own GSM generator based control panel by purchasing this kit. 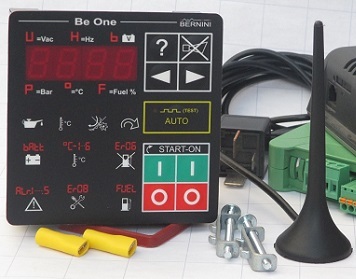 The BE1-GSM-KIT includes the Be1, Be16 and a MODEM. Cables and connectors are included as well. You have to separately purchase relays, fuses, terminal blocks and a box. You are required to install the Be1 generator controller (7) into your power generator (SEE THE TUTORIAL). You connects the BE16 GSM gateway (4) and MODEM. Put inside the MODEM (2) a normal SIM card. By using your mobile (1) you can directly configure the system.